SharePoint has always had fantastic built-in support for metadata, but many organizations have not yet harnessed the power of metadata to build new efficiency, productivity and security into their business. This post is the third in a series that will take us on a tour of what metadata is, how organizations can take advantage of its benefits and the SharePoint 2013 features that support it. 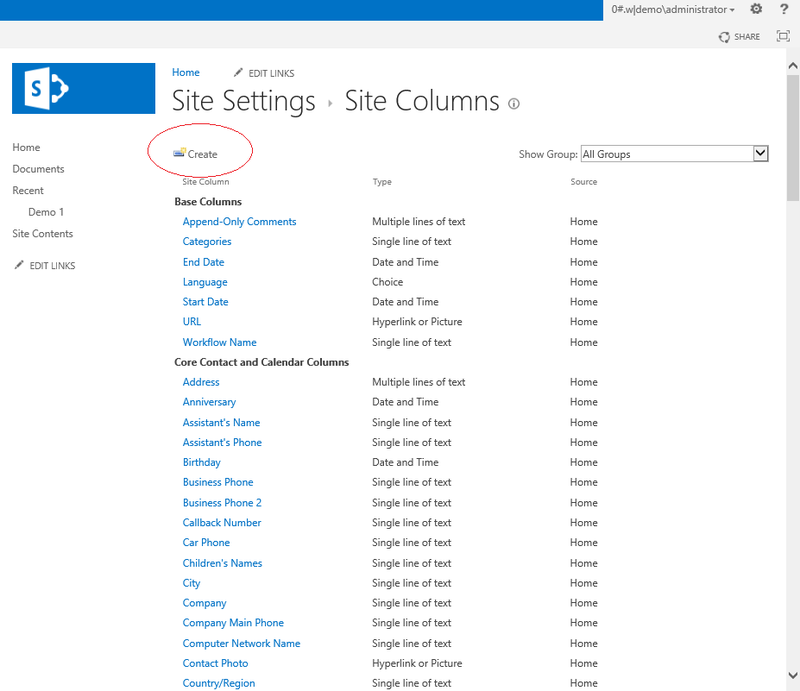 Today let's look at the Site Column feature. This feature allows you to create metadata columns at a higher scope from the library or list. With site columns, you essentially create and manage columns similarly to the methods described above, however you create and manage them for a site or site collection. The columns created here do not ever appear on a site page, nor are they ever used by the site itself. Site columns are still only used by libraries or lists. The advantage of using site columns is that if you have a large site or site collection, with either many libraries/lists or many sub-sites, you can centralize the management (to some degree) of all metadata columns in all libraries and lists in the site or site collection. So, for example, if you have a moderately sized site collection with 5 sub-sites, each sub-site has on average 20 libraries, and each library has a 'classification' column with 5 classification field values available. If you create the 'classification' column on each library that's 100 metadata columns to create and manage. The likelihood of errors or inconsistencies appearing in the 'classification' columns deployed to each library is quite high. As well, the amount of work to create and manage the columns is also high. With site columns, in this case, at the site collection level you can create 1 site column called 'classification' with the 5 field values that are available, and then add it to each library on which it is required. You create the column only once and you manage it in 1 place. When settings for that column need to change you simply edit the column at the site collection level, and the changes will be automatically deployed to all libraries which use the column. Note: when you create a site column, you still need to visit each library or list which requires that column and explicitly add the column from the site column list. The following page will appear and you'll see that many site columns already exist. These are pre-created within SharePoint 2013 and are available to use on your libraries or lists. To create a new site column, simply click the Create button in the top left side of the page and you'll be taken through the same column creation pages shown above. In order to access the site column page and create site columns for a particular site, you will need to be part of the site owner's group on the site. A last important note about site columns is that they can be created on any site or site collection, but the scope at which they are created is important. If you create a site column on a site collection, the column will be available to any library or list within any sub-site in the site collection. However, if you create a site column within a sub-site, the site column will only be available to libraries and lists within that sub-site or any sub-sites within that sub-site. It will not be available to the site collection. So, when creating site columns its important to determine at which level you will be using those columns, either at the site collection level and downwards in the site hierarchy, or at a sub-site and downwards in the hierarchy starting from that site.